Last December, during the holiday rush, Gatwick airport, the second busiest of the UK was paralyzed for three days due to drone sightings. The disruption impacted 140 000 passengers; more than 1 000 flights were cancelled, and many more delayed. Three weeks later, Heathrow airport, the busiest in the country with about 214 000 passengers a day and a daily average of 1 300 flights taking off and landing, was paralyzed for one hour for the same reason. On Jan. 22, the same problem occurred close to New York’s Newark Liberty International Airport, which led to a brief stop of incoming flights during peak hour. The presence of drones near airports is a growing threat in terms of infrastructure and transport safety. It is also a pressing issue for airlines as these shutdowns represent a huge loss of revenue, including additional cost to compensate prejudiced passengers. Indeed, the Gatwick shutdown cost $19mn to EasyJet: $6.5mn to compensate the 82 000 impacted passengers and $13mn of lost revenues, as the airline had to cancel 400 flights. Indeed, drones represent a major threat for aircraft. In addition to deliberate terrorist use, the simple contact of the device with an aircraft may endanger its entire structure integrity. Despite the widely held view according to which drones are like birds, reality is more complicated. Drone construction materials are much denser and stiffer than muscles and soft tissues of birds, as Popular Mechanics reminds. Simulations have shown that when a bird goes into an engine, it gets “liquidized” by the blades, but it does not go so smoothly with a drone. Last December, a Boeing 737 operated by Aeromexico managed to safely land after its nose was damaged in a collision with what was supposed to be a drone. Furthermore, the other big drone danger for aircraft is that their batteries ignite when damaged, which could be a problem if it occurs inside of an engine. A British government consultation noted that the number of incidents “involving objects believed to be drones” had risen from 6 in 2014 to 93 in 2017; thus, the threat is not merely serious; it’s growing. The two British shutdowns seem to have raised awareness among politicians and air transportation stakeholders. Indeed, after the Gatwick shutdown, the two main British airports announced that they were about to invest in counter-drones equipment for several million pounds. 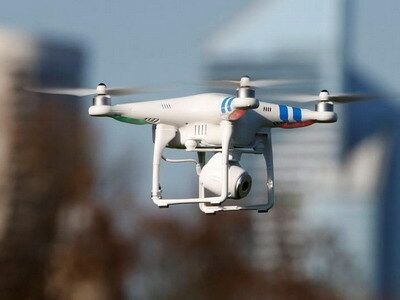 On its side, the British government announced in a document called “The Future of Drones in the UK”, that it will broaden the area drones are banned around airports from 1 kilometre to 5 kilometres, which pleased the British Airline Pilots Association (BALPA), which had been calling for such measures for every UK airport for several years. The document adds that authorities are also “working with manufacturers to introduce new technologies which will help in making sure drones are used in accordance with the law”. Such laws forbidding the use of drones within 5 km of airports could help limit the danger caused by hobby drones. Indeed, a study made by Dedrone, a company specialized in counter-drone solutions, showed that 280 unauthorized flights disrupted four British airports during a six-month period. The study reveals that more than half of these flights occurred on Friday, Saturday and Sunday, underlining the fact that hobby flights are also a great threat. “[While] increasing the restriction zone would not prevent a deliberate incident, it is important that proportionate measures are in place to help protect all arriving and departing aircraft using our aerodromes and avoid potential conflict with legitimate drone activity,” said Liz Sugg, the Under-Secretary of State for Transport. “Drones have the potential to bring significant benefits and opportunities, but with the speed of technological advancement comes risk,” she added, reminding that safety and security had to be the top priority. Besides, since last November, owners of drones weighing between 250 grams and 20kg will have to register and to pass a drone piloting test. Police officers will now be able to impose a £100 fine (€112) if a holder refuse to land his drone or does not prove it is registered. But how can airports actually fight against drones? How to fight these freely available and largely untraceable objects? First, the home Office, in charge of domestic security, said it will begin to look at different counter-drone options to secure sensitive sites such as airports and prisons. Secondly, technological equipment could be installed to counter drones. Counter-drones devices such as Rafael’s Drone Dome (used in Gatwick after the incident) could also be implemented. This device is equipped with three elements: a radar, an electro-optical/infra-red system (for fine tracking and identification), and a radio-frequency jammer. Nevertheless, this kind of equipment has limited appeal to airports due to its high price, often several million dollars, as the Wall Street Journal underlines. For now, they are most of the time used in military facilities, correctional institutions and stadiums. Indeed, such devices are difficult to use in an environment where commercial aircraft are in operation as it could disrupt legitimate communication links. For now, as The Wall Street Journal underlines, only a few US airports have advanced detection programs and almost all are in the testing phase. Nonetheless, as The Economist noticed this week in a couple of detailed articles, Indra, a Spanish-based technology company, announced that it has completed extensive testing of an anti-drone system called ARMS. After confirming and identifying the type of drone through infra-red cameras, the system determines which type of signals the drone is using to precisely target the jamming. Thus, it would avoid affecting other electronic equipment; which would be a great advance for airports. However, these type of tactics could be countered thanks to “jam-proof” mode that equips some drones. Indeed, these drones flying a pre-programmed flight path and using a navigation system not linked to a satellite signal makes it more difficult to interrupt them. After the Gatwick and Heathrow incidents, some people asked why the military couldn’t just simply shut down the drones. In fact, things are much more complicated than that, even if drones sometimes seem to be vulnerable when they are taking pictures at low altitude. At higher altitude, drones are just a dot in the sky, making them difficult to pinpoint and reach. Nets, eagles, other drones or laser are also being studied for counter-drones purpose. But each of them has drawbacks: short range for net-guns or the ability to fly only in daylight for eagles, etc. As The Economist explains: one solution comes from within: ”with more manufacturers installing features such as “geofencing” in drones’ mapping software, to prevent them straying into restricted areas’. In India, the government opted for another tactic, and asked its indigenous producers to implement a chip inside of drones which can disable it in case it turns rogue. As Asif Anwar, executive director at Strategy Analytics, underlines, it’s a combination of these approaches that is needed. He reminds that “a counter drone solution has to feature several important capabilities: Monitoring the spectrum to identify RF signals that are suspicious; finding the source of the signal […] sensing the threat, […] [and] neutralizing the threat”. Nevertheless, he added that the effective implementation of these systems will mostly depend on the budgets allowed to counter-UAS systems. Gatwick and Heathrow events have raised awareness on the risks created by drones. Step by step, governments implement new legislation to frame their use and facilitate their cohabitation with manned aircraft. However, there is still a long way to go before airports, planes and passengers can be totally secured against this threat.